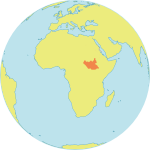 JUBA, South Sudan – Ferocious violence erupted in Juba, the capital of South Sudan, on 7 July, two days before the fifth anniversary of the country’s independence. Hundreds of people were killed or wounded, tens of thousands were displaced, and women became targets of sexual violence. Yet amid the bloodshed, heroes emerged, like midwife Aber Evaline, who stood her ground to do what she does best: protect the lives of women and newborns, even under gunfire. By the morning of 9 July, an eerie calm had settled over the capital, and Ms. Aber reported for duty at Juba Teaching Hospital. But soon, intense fighting engulfed the city, and she found herself on lockdown. The restrictions on civilian movement meant no other staff could come to relieve those at work, putting Ms. Aber on duty, day and night, for five straight days. As bullets and mortars ripped through the city outside, she became much more than a midwife. She was the ward in-charge, a pharmacist, a mentor, a cleaner and a comforter to terrified mothers and screaming newborns. Together with two midwifery students, an anaesthetist, and the medical officer on duty, Dr. Kanydany, they would perform 60 vaginal deliveries and seven Caesarean sections. Twenty-eight-year-old Poni Betty was in the last trimester of her fourth pregnancy when the violence broke out. Heavy fighting forced her and her family to flee their home. Suddenly, she was seized with pain and began to bleed. Ms. Poni knew she had to get to a hospital, but family members tried to change her mind. It was too dangerous, they said. But she knew she could not give birth without help; her last baby had been born by Caesarean section, and midwives had informed her that she would need extra attention during delivery. 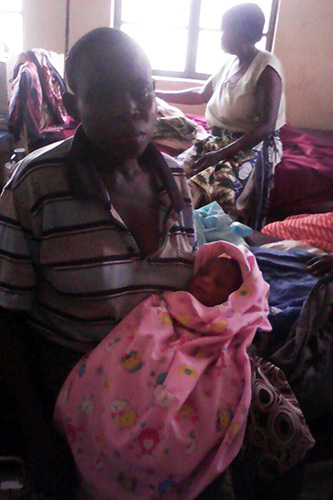 With the help of a neighbour and family friend, she made her way to Juba Teaching Hospital. They tried several routes, changing directions when they encountered gunfire and armed checkpoints. Dead bodies lay in their path. When they finally arrived, Ms. Poni was in grave condition. Ms. Aber quickly diagnosed placenta abruption, a life-threatening complication in which the placenta detaches from the uterus. Ms. Poni needed emergency surgery. “They found my uterus had ruptured,” she said. Her son needed to be resuscitated after he was born. Still, both mother and baby quickly recovered. Ms. Aber was not alone. Many midwives and midwifery students worked tirelessly to save as many lives as possible – and to help one another withstand the ordeal. 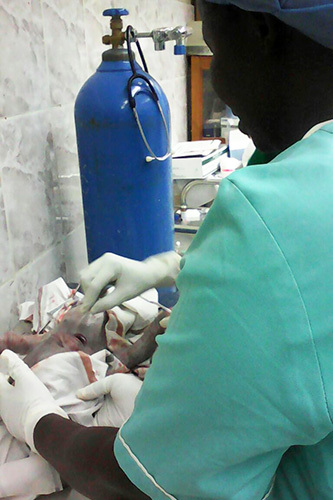 There are 45 United Nations Volunteer midwives deployed throughout South Sudan. These deployments are supported by UNFPA and the governments of Canada and Sweden, which also support the Juba College of Nursing and Midwifery (JCONAM). “I endured days living on water only, and when I finally got something to eat it was the midwifery students from JCONAM who shared their meals with me,” Ms. Aber said. Fighting subsided after 11 July, but the situation in South Sudan remains tense. Ms. Poni is still haunted by her experience. But she is also relieved. “The dead bodies we saw around my home and on the way still hound me. But it also speaks to the big hearts of the medical staff, who sacrificed a lot to take care of their patients,” she said. “If it wasn’t for the compassionate staff at the hospital, I don’t know what would have happened to me and my baby."